Cheeses were originally smoked almost by accident, as they would be hung in the rafters of houses or shepherd’s huts and continually wafted by the smoke from the household fire. From Spain there’s Idiazábal and Ahumado de Pría; from Italy, there’s Ricotta Affumicata; the Germans bring us Rauchkäse; and in Switzerland, you can buy Raclette Fumée (which sounds amazing). In Britain, Applewood Cheddar is probably the most well-known. It’s made with flavouring but still has a good taste. But there’s also a whole host of traditionally-smoked cheeses now available, including cheddars such as Montgomery’s and Quickes (both smoked over oak). Other classic smoked cheeses are Lincolnshire Poacher and Caws Cenarth caerffili. But it doesn’t stop at the hard territorial cheeses. You can buy Ribblesdale Smoked Goat Cheese, High Weald Dairy Smoked Duddleswell Ewe’s Milk Cheese, Ballyoak, a smoked brie from Five Mile Town Creamery, smoked Ardrahan (a washed rind cheese) and even smoked Stilton from Cropwell Bishop. And if you can’t find what you’re looking for? Extra challenge points for anyone that smokes their own cheese using a tin can and a soldering iron. 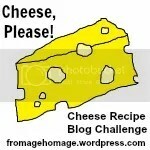 Want to take part in November’s Cheese, Please! Recipe Blog Challenge? Check out the full rules here. Ha! I like a challenge. Can I use a naff jumper instead of a cardi? I’ll see what I can dredge up. We’ve had moths though. I’ve smoked my own cheese with my Cameron Stovetop Smoker (also fish, duck, pork, chicken, tofu, etc) – unfortunately, I don’t think they’re available in the UK, but if they are, they’d make a wonderful addition to your kitchen. They come with a choice of wood chips (I buy the lot); alder, oak, hickory, cherry, apple, maple. Just follow the instructions for heating the chips until the smoke, seal the lid and wait 30 mins. Voila! Ooh, sounds lovely. Some local chaps were recommending their home-smokers to me but I fear it’s the sort of thing I would use once and consign to the cellar with the juicer and the pasta maker. I’ve only just discovered smoked cheddar which I picked up, ready sliced, at my village shop and I love it. I cut it into jack-o-lantern shapes and put it on top of some yummy beefburgers for our Halloween feast. I’m debating entering that post into this linky, but I didn’t include a specific recipe in the post.. just a kind of throw-it-together recipe. Would that be ok? Love smoked cheeses. Using Smoked Gouda tonight in a Meatless Monday recipe. Love a Gouda – have you tried an aged one? All caramelly and amazing. Look forward to seeing what you’re cooking up – do share it if you’d like to.